Vesta, now better than Hubble! Closer and closer! 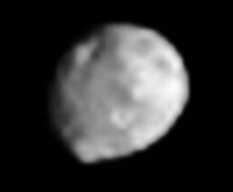 Vesta is still fuzzy, but as Dawn inexorably draws closer it's beginning to come into focus. The view is now better than anything Hubble has ever returned to Earth. This is the beginning of our exploration of previously unexplored territory! The image was released by the Dawn Framing Camera's home institution, the Max-Planck-Institut für onnensystemforschung, earlier today. Dawn captured this view of Vesta on June 14, 2011 from a distance of about 265,000 kilometers. Each pixel spans roughly 25 kilometers. The view is now sharper than Hubble's! There's clearly a deep crater in the northern part of the image. And the outline is definitely lumpier than the outlines of similarly sized bodies in the outer solar system (like Mimas and Enceladus), but we knew that already; the rock that Vesta is made of is able to hold up steeper mountains than the relatively low-strength ices that outer planet moons are made of. Apart from that, it's still hard to tell what's albedo differences and what's topography. But that won't be true for long. Vesta: Ready or not, here we come!